The global L-lactide market was valued at US$ 781.81 Mn in 2017 and is anticipated to expand at a CAGR of 14.1% from 2018 to 2026, according to a new report titled ‘L-lactide Market: Global Industry Analysis, Size, Share, Growth Trends, and Forecast, 2018–2026,’ published by Transparency Market Research (TMR). The global L-lactide market is driven by a rise in demand for bioplastics. North America accounts for a major share of the global L-lactide market. Increased consumer preference for biodegradable materials and rise in environmental concerns are anticipated to drive the global L-lactide market. The highly used bioplastic polylactic acid is produced via the formation of L-lactide. The unique properties of L-lactide, such as sustainable nature, barrier properties, and appearance, make it ideal for use in packaging applications. 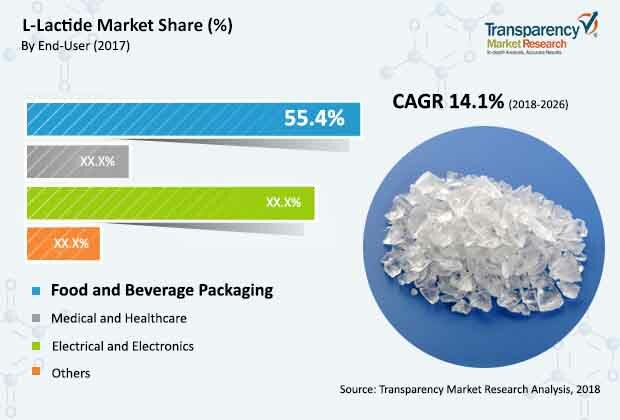 Stringent regulations on plastic consumption in developed regions such as North America and Europe are expected to have a positive influence on the expansion of the L-lactide market. Demand for L-lactide from various medical fields, such as controlled drug delivery systems, tissue regeneration, and medical implants, is on the rise owing to the favorable biocompatibility and mechanical properties of the material. Increase in consumption of L-lactide for biomedical applications such as orthopedics, drug carriers, facial fracture repair, tissue engineering, and uteral stents is expected to provide better growth potential for the L-lactide market. Emergence of nanotechnology and material science using biomaterials has prompted researchers and manufacturers of medical devices to come up with advanced technologies using L-lactide. The global L-lactide market is dominated by the food & beverage packaging segment. L-lactides have been used as packaging materials in the last few years, mainly as containers for dairy, bakery, and fresh food products. Food containers, bags and cups, disposable serviceware and utensils, lamination or coatings for paper and paperboard, foam products for trays, and other packaging materials and films manufactured using L-lactide are gaining popularity due to the favorable material properties and superior performance of the material. However, the low heat distortion temperature of L-lactide restricts its use to ambient temperatures. In terms of consumption of L-lactide, North America accounted for a major share of the global L-lactide market in 2017. Implementation of favorable government policies and regulations on plastic consumption have propelled the expansion of the L-lactide market in developed countries. The federal government aims to drive demand for bio-based products through procurement programs. Increased consumer preference for biodegradable materials and rise in environmental concerns are anticipated to drive the L-lactide market in North America. Key players profiled in the report include NatureWorks LLC, Corbion, Polysciences, Inc, and Futerro. Many manufacturers engaged in the production of polylactic acid strive to manufacture L-lactide as well.